And of course we’re extremely proud to serve groups like the Girl Scouts of America, Michigan Dental Association, Michigan Education Association, Detroit Lions and Detroit Red Wings, Walmart, Quicken Loans, Mormon Tabernacle Choir, U.S. Army, Ford Motor Company, United Auto Workers, Michigan State University, the University of Michigan and Western Michigan University. But in today’s competitive world, NO WAY are we about to rest on our laurels. We’re striving to be your motorcoach transportation provider of choice for the next 100 years! And that’s where you come in. Please, take five or 10 minutes to complete our brief questionnaire. 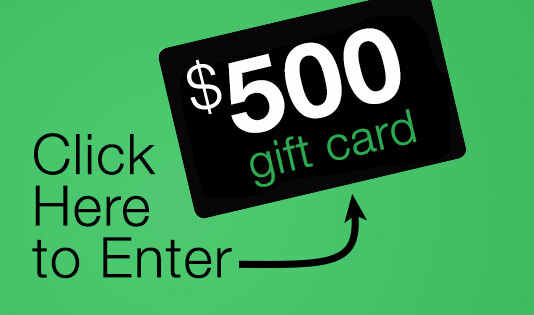 If you have the luck of the draw, a $500 gift card could be yours. And by helping us to serve you even better, you’re sure to be a winner either way. 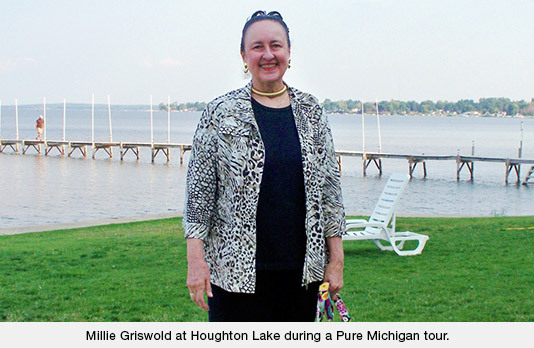 “It was just wonderful,” says Millie Griswold, when she picked up a Custom Holidays brochure and took her first motorcoach tour to Mackinac Island with her husband, Tom, in 1999. The couple soon found themselves captivated with charter tours and the variety of single- and multi-day trips they could take to places around the state and nation. Because Indian Trails does its utmost to please tour customers, tour operators like Custom Holidays of Allen Park, Mich., often choose us to provide motorcoach transportation to destinations throughout North America. Though, sadly, Tom passed away four years ago, she decided to keep touring. “He encouraged me to do so,” she says, adding that she never feels alone thanks to the camaraderie of her fellow travelers, as well as tour guide Sue Biggs, owner of Custom Holidays in Allen Park, Mich.
What’s been especially important, she added, is the positive feedback the company has received from their tour-goers. They’ve been especially impressed with our modern fleet and its custom features like 110 volt AC outlets at each seat for charging mobile devices—especially desirable on long trips. She also appreciates the training and professionalism of our drivers. In her nearly two decades of travel via charter tours, Millie has visited places like Branson, Mo. ; Detroit’s Fisher Theater; Nashville, Tenn.; and Stratford, Ont. for musical and theatrical productions. She’s also hopped aboard motorcoaches for themed tours of resale shops, herb farms and historical sites. For Millie, it’s all about the memories she makes on each trip, and the friendships she’s creating with others who share her interests. Let’s say you’re arranging a family reunion and need to get a large group of relatives from Point A to Point B for the festivities. What’s the first step to securing motorcoach transportation? 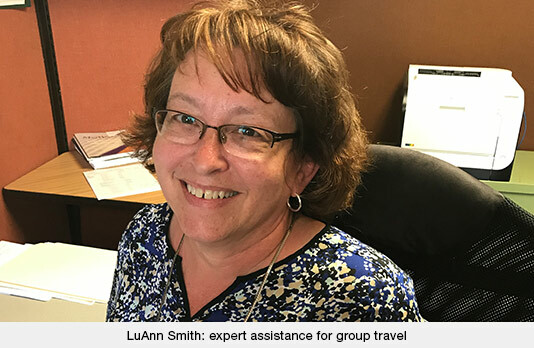 It’s as easy as calling one of our friendly charter sales consultants like LuAnn Smith, who’s been arranging trips for families, corporations, sports teams, school districts, special interest groups, and others for 11 years. What are the start and end dates of the trip? Where will you leave from, and where are you going? Will it be a single- or multi-day trip? 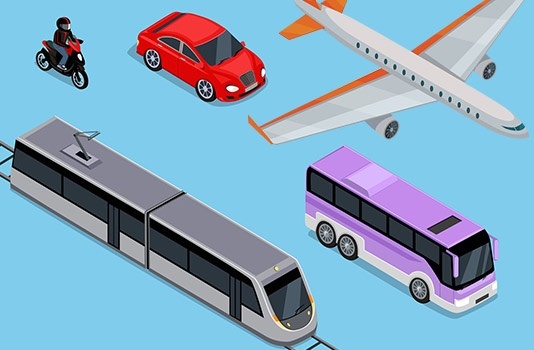 Will you need the bus for side trips while at your destination? The dates are most important, says LuAnn. Because reputable charter bus service is often in high demand, the further out you plan your trip, the greater the likelihood that a coach and driver will be available. To give you the most accurate price quote for a charter bus trip, our sales consultants will need a good idea of your itinerary. For example, if your group wants to stop for a meal at a particular restaurant, or detour to a sight like Paul Bunyan’s statue in Manistique, Mich., it’s best to mention that. The more information the better. Cost depends partly on the distance, duration and number of buses needed for a particular trip. The Indian Trails fleet includes 30-,52- and 56-passenger motorcoaches. Items like tolls, parking fees, bridge costs, historic districts fees, and pick-up fees at airports are included in the initial quote. Other items that may be included in the overall cost: A $500 security deposit will be added to the bill if your group will be bringing alcohol and/or food on the motorcoach. (However, it’s refundable if there’s no damage or excessive cleanup.) Also—if requested—coolers, catered meals or extra water are available at additional cost. Do You Know the Safest Ways to Travel? For decades, the U.S. Dept. of Transportation (USDOT) has been tracking incidents involving major modes of transportation. So, the facts are beyond dispute: U.S. commercial airlines are tops in terms of passenger safety; they were responsible for zero deaths in 2015. Next come buses—including motorcoaches like those operated by Indian Trails, as well as public transit and school buses—which are the safest form of surface transportation, along with passenger trains. But that doesn’t mean the nation’s roadways are safe: 35,092 people died in motor vehicle crashes in 2015. Of those (according to these tabulations) 22,543 were in passenger cars and trucks; 5,376 were pedestrians; 4,693 motorcyclists; 817 bicyclists; 600 large truck occupants; and 1,063 “other” (including 49 bus riders). Clearly, automobiles are one of the deadliest ways to get from here to there, and motorcycles are far worse. "A motorcyclist who traveled 15 miles every day for a year, had an astonishing 1 in 860 chance of dying," Savage wrote. On the other hand, "A person who took a 500 mile flight every single day for a year would have a fatality risk of 1 in 85,000." How about Indian Trails’ safety record? We’re ranked by USDOT in the top 5 percent of transportation companies nationwide for safe driving.